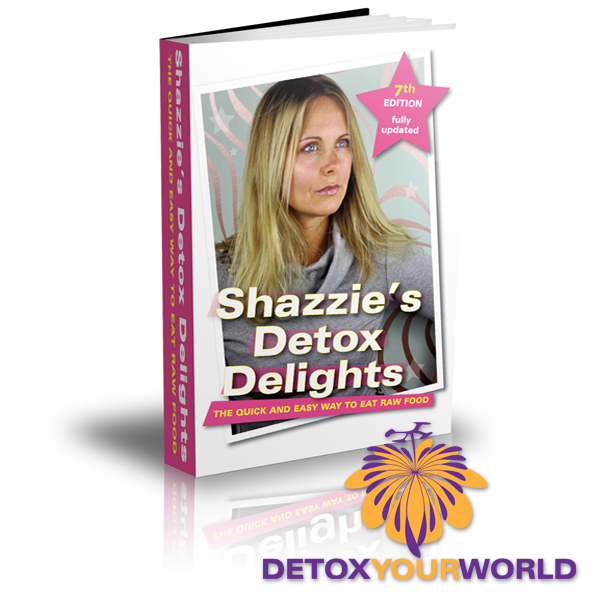 Shazzie's detox delights is taking the world by stealth! This book makes a fab gift for all your loved ones. You can now show them you care without nagging about raw food or veganism! This book is both raw and vegan, but it doesn't say so!! And it doesn't matter -- what's important is that it lets you know it's easy to be healthy, and be the person you've always wanted to be. 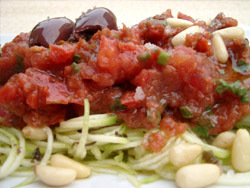 This 54 page mini-book is jam-packed full of healthy yet mouth-watering recipes and tips. Have you ever wondered how you can make recipes which will help you beat food cravings, detox at your own pace and feel good about your food choices? 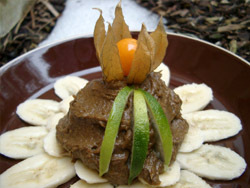 Shazzie's detox delights was created especially for this purpose. The recipes in this book have been carefully formulated to be low in toxins to allow your body to clean itself out.This means that you can immediately start eating food which is good for you, without feeling that you're missing out! 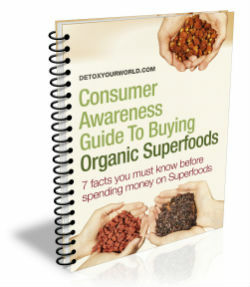 It also outlines the reasons why you may need to detox, why it can be delightful, the effects and benefits. 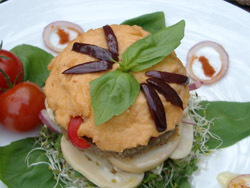 With recipes such as Eat it off me Beppe andPurple burple, you will want to create them as soon as you get the book home! 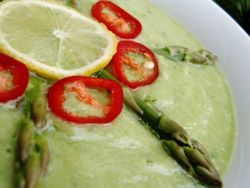 The many sections include smoothies, salads, soups, main meals, dinner party menu ideas, side dishes, and puddings. 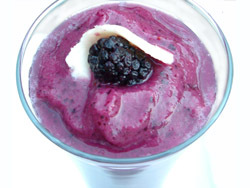 You will not believe how some of these recipes are made! After the extensive recipe section, there is suggested further reading material, a list of support and contact organisations and unbelievable transformation photographs of the author, Shazzie. Have a sneak preview of these pictures now athttp://www.shazzie.com/raw/transformation/! I just received "Shazzie's detox delights" and I am moved to tears! What a beautiful work of art, oozing with love! It's one of the most beautiful books out there -- the layout and design are perfect! And let's not talk about the contents -- the recipes sound yummy and just right for somebody who needs a little help in loving her/his body into health! I will start right away and have something nice now.... hmmm...let's see.... oh, the choices! I have another raw recipe book, but it is sooo complicated and needs so many hard to find ingredients that I only used it occasionally -- but I just know that Shazzie's book will be my daily companion! Thank you!!! Shaz, you've done a brilliant job and I am thankful for you! Bella (my 8 year old daughter) just loves your book, and she will surely make everything in it in time! Shazzie's detox delights, is a delicious, delectable, delightful -- in every aspect gem of a book....simply seductive, sensually scrumptious..... Buy it! Shazzie has a recipe that is my favorite right now... Green Diamond -- Honestly, I woke up this morning and that is all I could think of and I hadn't even hit the floor yet. Hi Shazzie! Your book is so nice! I've tried some of the recipes this weekend (got it Friday morning!) and it tasted so delicious!! The book is perfect for beginners, and it is easy to comprehend! I just love the mix with avocado and banana! As soon as I feel more secure with this new way of life and establish more knowledge, I will start a little raw food movement here in Sweden and with the help of my brother in law, I'll start a site in Swedish! I think that would be most useful!! Thanks for the little hearts and the angel! And for signing the book....I carry the book with me wherever I go -- my inspiration....Take care for now. I gave the copy of your book to that lady I told you about and she LOVES it. Finds your writing and wonderful self-expression inspiring, down to earth and feels all your suggestions will help her. Says she also showed it to her practitioner and he agreed that it would be most useful!! Hi Shazzie. Wow, your book is awesome! I've tried some of the recipes already and can't wait to try some more! Keep up the wonderful work! "Shazzie's detox delights is the best book I have ever read for people who are interested in changing their diet habits for the better and changing their life. It is fun, simple and easy to follow. I highly recommend anyone who is interested in being happy and becoming free to read this book. It will change your life. Get ready to smile."